In the holy year of 1992 a momentous event took place. This divine year marked the 100th anniversary of the passing of Bahá’u’lláh. That year also brought a turning point in my own Bahá’í life. At the end of the Bahá’í Holy Year, I received a phone call that changed my life. Mr. R. N. Shah, then the Secretary of the National Spiritual Assembly of the Bahá’ís of India, telephoned from Bahá’í House in New Delhi. He informed me that the national institution had selected me to go for pioneering services to the Andaman and Nicobar Islands to serve as Executive Secretary of the Spiritual Assembly of the Bahá’ís of the Andaman and Nicobar Islands, effective Ridvan 1993. He also asked me if I was willing to take along my family. That unexpected telephone call left me dumbfounded. I was profoundly shaken. I did not want to give a second thought to this call, as such an opportunity may not come again in my life. I was more than convinced that it was a call from Bahá’u’lláh Himself, and therefore I consented to pioneer without even consulting with my wife Ratna Kumari and other family members. I knew my wife would support my decision as she too, by this time, had advanced in the Faith. When I spoke to her later that day, she gladly agreed. 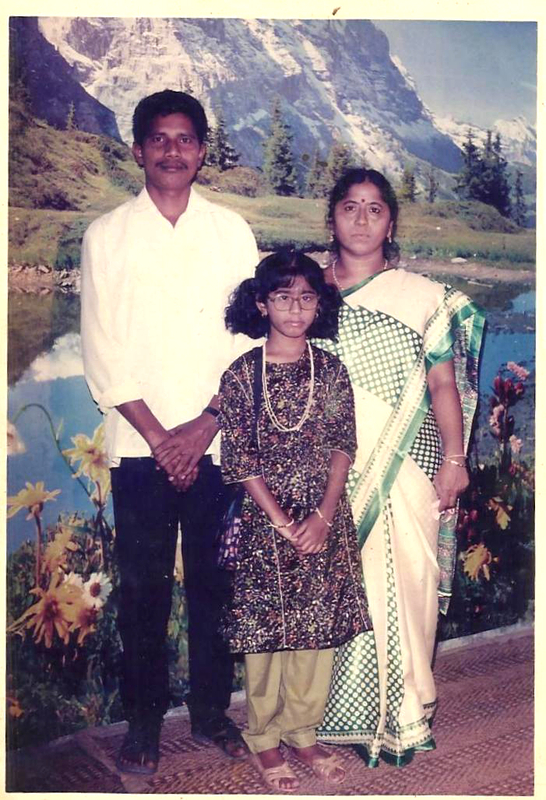 We decided to take our only daughter Kamala along, but had to leave my father under the care of my family in Andhra Pradesh. I was not clear on the unknown pioneering destination. At the most I had heard of the Andaman Prisons, where notorious criminals were incarcerated. Most Indians never wanted to even sleep in the direction of the Andaman Island as it was called “Kalapani” or penal settlement. Wheels started to turn petty fast! In Ridvan 1993, I was elected on to the State Bahá’í Council of Andhra Pradesh, and became the convener as well. Since I had already decided to leave for pioneering, my next step was to resign. Mr. R.N. Shah, contacted Mr. N.C. Baskaran, then the Secretary of the State Bahá’í Council of Tamil Nadu for cabin tickets for my wife, my daughter and myself. At this time, I received letters from the National Spiritual Assembly of India, the Universal House of Justice and Dr. Perin Olyai who was Continental Counsellor, all giving me assurance of prayers and blessing for my pioneering service. Getting direct communications from these august institutions, especially the Supreme Body sent shivers down my spine. It was very clear they had taken me seriously, and had placed much hope in me. I knew I could not be the same Jaya Raju Thota anymore. It needed a full transformation within me to rise to some hitherto unscaled heights. Many thoughts were racing through my mind- was I worth what these institutions were thinking of me, and would I rise to the occasion? After a farewell party for my family thrown by the Local Spiritual Assembly of the Bahá’ís of Hyderabad & Secunderabad (twin cities) we vacated the Bahá’í Center where we were staying, and moved into the house of my father-in-law in Rajahmundry city. As soon as we received a telegram from Mr. N.C. Baskaran confirming our tickets, we immediately rushed to Chennai city in Tamil Nadu by train. Upon arrival in Chennai Bahá’í Center, we had only two days of preparation for the sea journey for Port Blair, capital of Andaman and Nicobar Islands. Finally, we were in the ship, and after 80 hours of sea journey, we arrived in Haddo Harbor, Port Blair, close to midnight. As I stepped on the Andaman soil, I prayed in my heart, “Here am I Bahá’u’lláh. I am your instrument, please use me in whatever way you want.” To my great surprise, members of the Spiritual Assembly of the Bahá’ís of the Andaman and Nicobar Islands came to receive us, and that gave me goose bumps. It was clear that the national institution was expecting much from this unworthy servant. 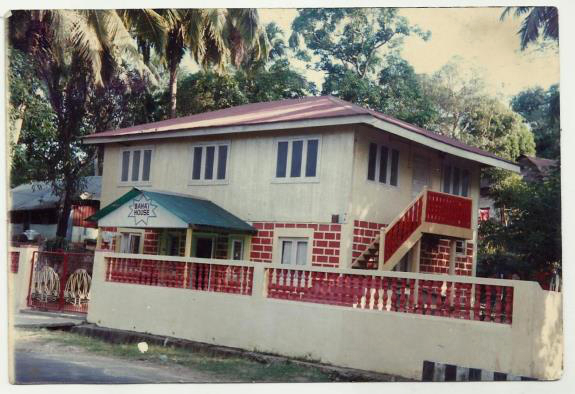 We were accommodated in the Bahá’í House in Port Blair. We were told not to cook for ten days as arrangements had been made to provide us meals for those ten days. The national institution was so kind to us. Soon the first task fell upon me. I met the national institution, and I was asked to learn and concentrate on office works. I worked hard, trying to understand the domestic situation by going through all the documents availed to me. The members of the national institution lovingly guided me into getting the pulse of the local situation. I studied the history of the Faith and saw records of great services other Knights of Bahá’u’lláh like Dr. K.M. Fozdar who came to Andaman and, Jeanne Frankel and her mother Margaret K. Bates who came to Nicobar. I considered myself tinier than a dead ant when I learnt of what they had done for the Cause. My first teaching trip to the islands started in the Diglipur area in North Andaman, located close to Yangon in Myanmar. I joined the local believers in, then, initial teaching trips. The journey visiting several interior villages usually took several hours, involving change of several buses and even ferries. These journeys could be very dangerous, since the hostile Jarawa aboriginal tribes resided along the west coast of South and Middle Andaman could attack us any moment. In many cases, public transport would be accompanied by police escorts. I also started visiting South Andaman, Middle Andaman, North Andaman, Little Andaman, Campbell Bay in Great Andaman and almost all villages of the Andaman and Nicobar Islands for teaching activities. With the help of the local believers I could grasp the ground situation quickly. But I had my own challenges, prominently not knowing the local languages. In the Andaman and Nicobar Islands, the spoken languages were Bengali, Tamil, Malayalam, Marathi, Telugu, English, Nicobarese, Kannada and Hindustani (Hindi mixed with Urdu). A large number of Indians descent resided in these Islands, hence called “Mini India.” I could speak fluent Telugu and English. Where language was a barrier, I also would request some educated youth to translate into their local languages. Often, pioneering services are not be a bed of roses. There could me many thorns on the path. My daughter’s admission into the Senior Secondary School in Port Blair became a nightmare. She was admitted in her first standard in English Medium. Initially, Mr. Koushik, the principal of the Senior Secondary School in Port Blair did not give admission for my daughter, but on pleading he allowed her for only three months. He informed me that when a student transfers to any other state in India, the Transfer Certificate has to be counter signed by the District Education Officer in mainland India within three months, a rule I was not aware of. I feverishly contacted my relatives, Auxiliary Board Member Mr. Fazli in Secunderabad, including the State Education Minister in Hyderabad, but in vain. There were several complications. I was devastated. I lamented silently with ardent prayers. Sleep and peace of mind left me. What else could be more important than education for our only child. My family came for serving the Cause. I knew Bahá’u’lláh would not forsake us. After a few days of tearful prayers, I went to the chamber of the principal to inform about the impossibility of getting the Transfer Certificate counter-signed. He did not accept my explanation, as he had to follow the rules. I came back very upset. I resorted to even stronger prayers, and fell sick. My wife was very worried. My daughter was totally at a loss. After a few days, I went back to see him the third time, but as soon as he saw me, he yelled at me to get out of his office, right in front of the other staff. I was humiliated, and even thought Bahá’u’lláh had not heard our prayers. This time my wife daughter and I prayed harder than ever begging Bahá’u’lláh to solve the problem. After a few days, I went back to his chamber the fourth time, this time with some Bahá’í leaflets and Bahá’í albums to give him the Bahá’í message. I had a great surprise in store. I was totally shocked and surprised. As soon as the principal saw the Bahá’í material in my hands, he asked me to sit down and explain about the Faith. The principal was impressed with the teachings of Bahá’u’lláh, especially on the Bahá’í moral education. When I quoted Dr. S. Radhakrishnan, former President of India praising the Bahá’í Faith, he was further impressed. Within a few minutes of teaching the Faith, the principal forgot about the rules he was following by the book, and handed over a piece of paper, and asked me to write down what I needed for my daughter. I thought I was in a dream world. I wrote that she should be promoted to 2nd class, and her surname should be added. He read over and said, “Done!” That was not the end. He further asked me, if I needed anything else. I just expressed my full satisfaction at that gesture. The principal then asked me for some Bahá’í cassettes, and that evening he followed me to the Bahá’í House to collect them. He became an instant friend and started visiting the Bahá’í House regularly, and befriended other Bahá’is as well. Mr. Shahin Javanmardi and Dr. (Mrs.) Habibeh Javanmardi and several other Bahá’is started inviting him for lunch or dinner. He asked me to come to his teacher’s quarters at Port Blair, where he arranged frequent firesides at his residence for his colleagues. Later, he was transferred to Rangachang where he asked the believers to conduct Bahá’í Moral classes, which was carried out by Dr. (Mrs). Habibeh Javanmardi. Then he was promoted as District Education Officer. This episode was an eye opener for me. At a time when we thought all doors were closed and our fate has been sealed, Bahá’u’lláh comes into the picture to prove that He is in total control of everything on earth and in the heavens. With His power around, all human limitations simply vanish into nothingness. Answers for prayers may be delayed, but the answers would definitely come at God’s good time and that time is the best. Teaching among the aborigines was highly exciting. When we undertook a teaching trip in Kadamtala village, I heard that the Jarawa aboriginal tribes used to attack villages during the night to steal iron rods, coconuts, bananas, and red pieces of cloth. These hostile Jarawa aboriginal tribes had the history of attacking or even killing alien people with their arrows. There was a belief that Jarawa aboriginal tribes killed and ate people. The urbanites had never seen any Jarawa tribal people, as they lived deep in the thick forests. During their attacks, carried out in groups, villagers were advised not to come out for fear of being killed. I was caught in one of those situations during a teaching trip. I stayed in the house, praying for protection of the lives of the village people. During the six months, the Jarawa boy was in the hospital, I took my wife and daughter to visit him. After some trips, he became friendly. When his leg was completely healed, the government offered him a job and proposed arranging a girl to marry. He refused, saying he had a sister and mother in the jungle. All he wanted was to go back to the jungle and stay with them. Meanwhile the Jarawa tribe which lost the boy started killing the general public with anger. To avoid open hostility the government made a decision to send him back into the thick forest where Jarawa tribes lived. A team was formed which took Enmay, without clothes, and left him alone in the forest. He was reported to have explained the entire episode to his people, and had informed them that the people in villages were not harmful. That was the starting point for the Jarawas to slowly start coming to the jetties to receive their food from the passengers, especially bananas. I was happy to have given the message of Bahá’u’lláh to many aboriginal tribal people of Nicobarese including this Enmay, which was probably my first attempt. On another of my teaching trips to Baratang Island at South Creek village one Mr. Henry (Nicobari tribe) declared his Faith in Bahá’u’lláh along with his local friend. As a pioneer, one may have to face rough storms in life. But Bahá’u’lláh’s presence and His protection is always with you. In one of our trips we sailed to Diglipur area by a private dinghy. I was told not jump into the sea or dip my hands into the waters, as there were many crocodiles. They even showed me several crocodiles while we were on the dinghy. As the dinghy was moving steadily, a crocodile suddenly shot out from the sea and grabbed a person who was sitting right next to me. With one bite, it killed him. The spot in the sea in which the crocodile attacked turned red, and became a horrible sight. I could have been the prey. But why him? I was clear that I was protected under the mighty care of Bahá’u’lláh. I saw that as a reminder that I had much work to be done for His Cause. Unimaginable victories followed some disappointments in the pioneering field. A few of us went to Hut Bay in Little Andaman for the conducting Ruhi Institute Courses and firesides. Different groups went to visit different villages according to language lines. I went to Telugu area in Hut Bay, along with one Bahá’í. With one fireside, nine accepted the Faith. Mr. Karranna, a new and fresh believer was so moved by the teachings that he came forward and donated a piece of land adjacent to his house for use as a Bahá’í Center. This victory was passed to the Local Spiritual Assembly of the Bahá’ís of Hut Bay, Little Andaman and the Secretary of the Spiritual Assembly of the Bahá’ís of Andaman and Nicobar Islands. The news of this achievement was covered by Bahá’í World News Service while we were still at in Little Andaman. I was also asked to give special attention to taking the Faith to the higher brackets in society. This was the biggest challenge for me. I knew it would not be an easy task when you are simply “nobody” by external standards. All I knew was that I was some instrument in the mighty hands of Bahá’u’lláh. The Spiritual Assembly of the Bahá’ís of the Andaman and Nicobar Islands gave me all the guidance and assistance I needed. I too kept the national institution informed of all my moves in the outside world. I had to pray hard for the path to open. In stages Bahá’u’lláh enabled me to widen my friendship with those in upper bracket. Most of the Indian Administrative Service and Indian Police Service Officers as well as Senior and Junior Officers of the Andaman and Nicobar Administration, including Lt. Governor became friends with me. They key to winning their hearts was my ability to swim. I won the first prize in swimming 7 kilometers up and down in the Andaman Sea. The State Sports Council of the Andaman and Nicobar Administration appointed me as a Swimming Coach for those very important officers of the Administration. It was this task of coach for swimmers that won many friends for me. Many of the senior officials came to me for training and gave me several opportunities to teach the Faith. Acquiring the Bahà’i burial grounds in the major islands was a pending goal for more than 30 years. We had only one burial ground in South Andaman. The national institution asked me to also consider working out this through my contacts, as they knew I had developed close friendship with Mr. Anindo Majumdar, Deputy Commissioner of Andamans who held eight ministerial portfolios. An event opened the path. It was a prayer meeting held for observing the Mahatma Gandhi Jayanti day, in which all religious groups were represented. I represented the Bahá’i Faith. After attending the prayer meeting the Deputy Commissioner invited me for lunch at his residential bungalow and we traveled in his car. After lunch, he asked about the teachings of Bahá’u’lláh. He was impressed and then asked me about the Bahá’í laws and ordinances. I mentioned some of them, including the laws on Bahá’í burial. He spontaneously asked if we had any burial ground. I told him we have only one in South Andaman, and it was not possible to transport the remains of a dead believer from other parts of Andaman and Nicobar Islands within one hour’s journey in accordance with our laws. Then the Deputy Commissioner dismissed me with great pleasure. On the following day, he rang me in the Bahá’i House and asked me to prepare a simple letter of request for burial grounds and he would send his driver to pick up the letter. The excited national institution immediately a letter on its letterhead, with names of the localities in major islands where burial grounds were needed. The car came and I myself went in the car and handed over the letter to the Deputy Commissioner. Within a few days, the Deputy Commissioner issued orders for allotting Bahá’í burial grounds in the name of “BAHA’I COMMUNITY OF ANDAMAN & NICOBAR ISLANDS”. The goals were achieved! During another meeting with him, he quietly whispered if he could offer a free land under my name, which I refused with expression of gratitude. There were other moments when the Deputy Commissioner joined me in visiting some Bahá’í villages, and we traveled in his car. The national institution also saw the need to reach the people through print and electronic media. I had to compile more than 1000 Bahá’í – inspired articles by both Bahá’ís and non-Bahá’ís. They were published by both the government and private sector newspapers of the Andaman and Nicobar Islands. I was also on the Andaman and Nicobar Press Club. Soon it became easy to get the Bahá’í articles published in the print media. I got newspaper columns as well as opportunities to present the Faith through All India Radio, Port Blair. I used to give regular radio talks on different educational topics, including the Bahá’í Faith. The opportunity opened a path for arranging some Bahá’í talks by Mr. Mehrzad Akhtarkhavari, Secretary of the Spiritual Assembly of the Bahá’ís of the Andaman and Nicobar Islands and Mr. Shahin Javanmardi, Auxiliary Board Member in a Hindi program called “Aaj Ka Din.” Arrangements were made for television coverage of one of our Bahá’í festivals in Chouldari village, South Andaman. The Chief guest was the Deputy Commissioner of Andamans. The national institution requested that I compile an article on Naw-Ruz to be published. 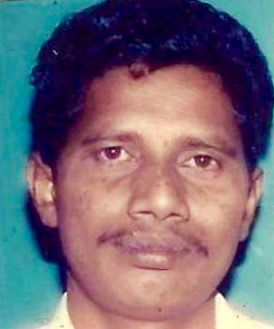 Mr. Hemchander who became a very good friend of mine during our swimming sessions in the Andaman Sea was a Manager of Government Press for publishing Government Gazettes, government news and general news in the Andaman and Nicobar Islands. The policy of the press was not to have any religious material published. I told him about this article and the significance of Naw-Ruz when we were swimming together in the sea one morning. He asked me send it to his chamber. When I personally handed it to him in his chamber, he read it through and was impressed. He then called the Chief Editor of “The Daily Telegram” and told him to get it published the next day. Next day, it was published in the English Newspaper that brought much publicity for the Cause, as this paper enjoyed the largest circulation. That was the first time any religious article was published on the Faith in that paper. Yet one more unforgettable incident was bringing the Faith to the academic circle. The Directorate of Education invited me to a seminar on “Value Education”, which was organized at Ambedkar Auditorium, Port Blair, with the collaboration of the Andaman and Nicobar Administration. Religious representatives from the Bahá’í Faith, Hinduism, Buddhism and Chinmaya Mission were invited to the Seminar as speakers. I was representing the Bahá’í Faith. The duration of the seminar was about five hours, commencing at 9.30 in the morning. The 1,500 audience was made up of academics who were senior teachers from the Senior Secondary Schools, including all principals of Andaman and Nicobar Islands. There were several other high ranking officers as well. The Chief Guest of the above seminar was Lt. Governor of the Andaman and Nicobar Administration. The Honorary Guest Swami Ranganathananda, President of Ramakrishna Math also spoke. We were all given only five minutes to speak. I invoked the name of Bahá’u’lláh and started to speak, adding Bahá’í Writings in my speech. The Director of Education was supposed to ring the bell one minute before as a reminder. He was so immersed in listening to the message of Bahá’u’lláh that he forgot the time allocated for me. I spoke almost for 30 minutes. The event was covered live by the television station, the All India Radio Port Blair station, and was also mentioned in the prime news bulletin. It was also published on the first pages in the government and private newspapers. As soon as the seminar concluded the Chief Secretary asked me to come to his chamber at the Secretariat the next morning. That same evening, the Deputy Commissioner of Andamans, who had seen the news over the television called me to his bungalow and congratulated me on the talk. The following morning, I went to see Mr. Narendra Prasad, the Chief Secretary in his chamber. I had a private and meaningful conversation with Mr. Narendra Prasad for more than two hours. He soon became a very close friend of mine. One day he was leaving for a visit to New Delhi. I went to send him off at the airport where I gave some Bahá’í literature and urged him to visit our Bahá’í friends at the Bahá’í House in New Delhi. I immediately contacted Mr. R.N. Shah, Secretary of the National Spiritual Assembly of India and told him about the coming of Mr. Narendra Prasad to New Delhi. On returning to Port Blair, the Chief Secretary told me that Mr. Shah met him in New Delhi, and expressed his happiness in meeting with him. One contact led to another over a period of time, thus widening the contacts. All these contacts with those in authority and top circles were consolidated. Early in the mornings I would meet the Deputy Commissioner in the swimming pool as a coach, in his office or his residence. On occasional nights, both of us would go for rounds around Port Blair. He would pick up me from the Bahá’í House. I used to go rounds around Port Blair with the Superintendent of Police as well. The Director of Information, Publicity and Tourism in Port Blair also befriended me. 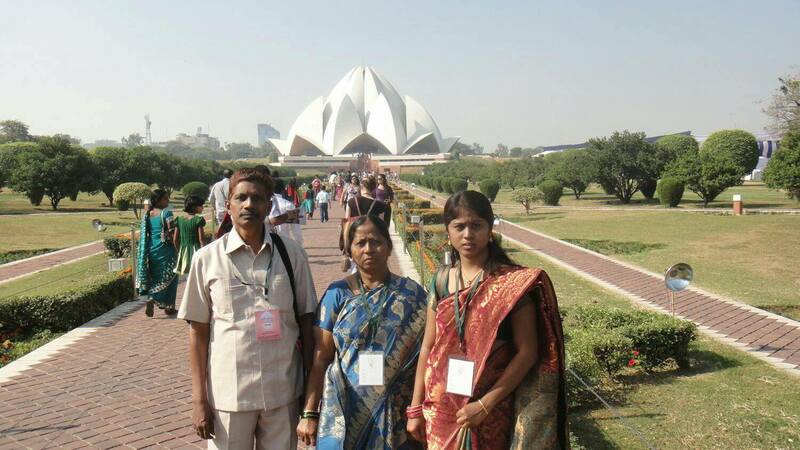 Rooms at Andaman House in the Indian mainland cities of New Delhi, Chennai, and Kolkata were also booked for Bahá’ís with just one telephone call. Several of the senior officials like Mr. Anindo Mazumdar who was Chief Secretary of the Andaman & Nicobar Islands, Mr. Tapan Kumar Mandal who was Deputy Commissioner of Andamans, Mr. Mukesh Kumar Meena who was Superintendent of Police, and one Anti-Corruption Branch Chief used to come to the Bahá’í House, where I was staying, for lunch or dinner. Several other Indian Administrative Service officers too came by. The Lt. Governor who soon became a friend of the Bahá’is was yet one more of the regular visitors to the Bahá’i House. It was wise of the national institution to have accommodated us at the Bahá’i House, as with several Bahá’i posters and photographs decorating the walls, the Bahá’í House itself was a self-teaching edifice. While coming to visit me they also met up with other believers and became their friends, and by extension friends of the Faith. I was equally a regular visitor to their residential bungalows. One of my close friends was Shri Ishwari Prasad Gupta, Lt. Governor of Andaman and Nicobar Islands whom I encouraged to visit our Bahá’í House of Worship in New Delhi. He, along with his family members and relatives, visited our Bahá’í House of Worship in New Delhi. Counselor Mrs. Zena Sorabjee welcomed him and his family members, and explained the importance of the Bahá’í House of Worship. After returning to Port Blair. Lt. Governor and his wife showed me the photographs of his visit to the Bahá’í House of Worship, and expressed immense happiness. The national institution urged me to keep in touch with all the heads of the departments and maintain a good relationship with them, which I did. I took this opportunity to teach the Cause of God among them. With help of such good relationship, many problems for the Faith were solved. For example, a parallel telephone parallel line was connected in the Bahá’í House, problems with the Andaman Lakshadweep Harbor Works with regards to the grills which were obstructing the flow of drainage water were settled fast, premises of the Bahá’í House were cleaned by Municipal cleaning staff at just a casual request. Having moved closely with those in authority, we were accorded special privileges. Bahá’ís and my family started to get special invitations for attending important and prestigious functions like Indian Independence Day and Republic Day celebrations at Raj Niwas (residential Bungalow of Lt. Governor) as well as Netaji Stadium. I used to frequently visit the Secretariat where the offices of the Chief Secretary of the Andaman and Nicobar Islands, all Secretaries and all heads of all government departments and agencies were located, for courtesy calls or Bahá’í official works. The Spiritual Assembly of the Bahá’ís of the Andaman and Nicobar Islands asked me to approach the Tahsildar (revenue collector) of Port Blair, for the demarcation of the premises of Bahá’í House in Port Blair, and the Bahá’í burial ground in Garacharma village in South Andaman. The Tahsildar became my friend through the Deputy Commissioner of Andamans. This was a long pending goal of the national institution. The demarcation was needed at the Bahá’í House to construct a two-room building for the Fozdar Institute. When I went to the office of the Tahsildar and explained to him about the need of the demarcations, he gave instructions to the surveyor to go along with me to the Bahá’í House to get the demarcation done without any delay. After that, the demarcation of the Bahá’í House, the demarcation of the burial ground in Garacharma village in South Andaman also done. On another note, the Deputy Commissioner also informed me that he had given instructions for all the Bahá’í burial grounds, which were allotted in all major Islands to be demarcated immediately. I informed the same to the Spiritual Assembly of the Andaman and Nicobar Islands. The Spiritual Assembly felt very happy. Whenever prominent Bahá’í visitors from abroad used to visit Andamans efforts were made to get them to meet up the local dignitaries for courtesy. An important event was a meeting that as arranged between the Deputy Commissioner and Dr. Payman Mohajer, Continental Counselor who was visiting Andaman. This meeting took place at the residential bungalow of Shri Anindo Majumdar who was the Deputy Commisiioner. Mr. Mehrzad Akhtarkhavari, the Secretary of the Spiritual Assembly of the Bahá’ís of the Andaman and Nicobar Islands initiated this meeting. With one phone call, a meeting was arranged that evening itself. Mr. Mehrzad was also present at that meeting. The friendly meeting lasted late into late night. I followed up meetings with the Deputy Commissioner. The Secretary of the Spiritual Assembly of the Andaman and Nicobar Islands, Mr. Mehrzad Akhtarkhavari informed that he received tip off that some unwanted elements were planning to disturb the celebrations of Bahá’u’lláh’s Birth Anniversary planned to be held in Chouldari village in South Andaman, by throwing rotten eggs and cow dung. All arrangements were made and it was too late to cancel the event. He came out with a brilliant idea of inviting Mr. Mukesh Kumar Meena, Superintendent of Police as a Chief Guest at the above holy function. Upon receiving my call Mr. Mukesh Kumar asked me to come to his bungalow and explain in detail the life history of Bahá’u’lláh. I gave him the details over lunch with him, and explained the planned mob. In the evening, we went to Chouldari village in his official car. As we were traveling in his car, I was surprised to see a large presence of police personnel in the premises. The Superintendent of Police had already sent them in the afternoon to the venue of the celebration. Those who planned to disturb the peace were nowhere to be seen. Is it not the power of Bahá’u’lláh? The Superintendent of Police gave a very good speech on the occasion. The function concluded with resounding success. Bahá’u’lláh’s blessings, protection and presence was visibly felt. Developing public relations for the Faith with those in authority is of vital importance. Even if they did not become Bahá’ís, it would suffice if they could be sympathizers of the Cause. With such contacts, at times doors opened one after another in the most miraculous manner. These were all God-given contacts for the Cause, with the prayers and blessings from the national institution. I never for a moment wanted to use those God given contacts for my own personal advancement. I was clear on this. I used those contacts for the Faith. All these contacts were somehow connected to the Faith, institutions or other prominent Bahá’ís. Conference at Bahá’í House, Port Blair. 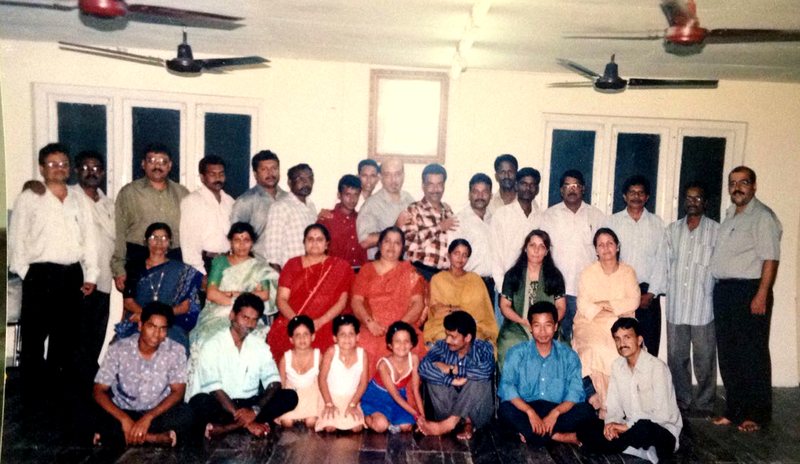 Jaya Raju Thota is standing third from right at the back row. When I arrived in Andaman, I served as Executive Secretary of the Spiritual Assembly of the Bahá’ís of the Andaman and Nicobar Islands, carrying out the tasks entrusted to me by the national institution. 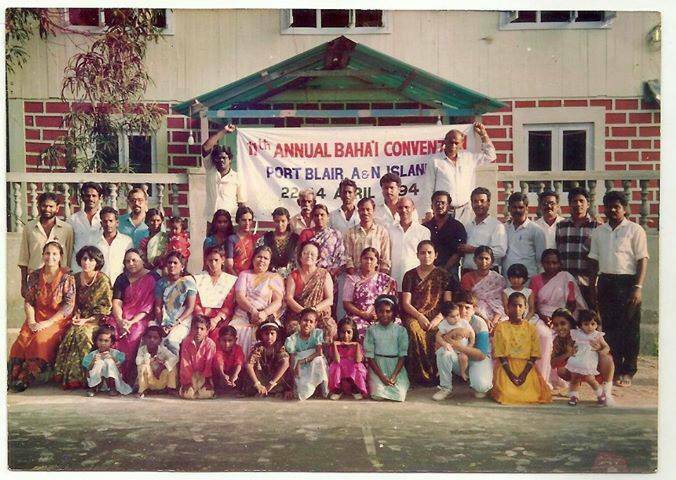 Later I had the privilege of serving on the Spiritual Assembly of the Bahá’ís of the Andaman and Nicobar Islands, Local Spiritual Assembly of Bahá’ís of Port Blair, and several other committees. Most of my time was spent in conducting the deepening classes and going for teaching and consolidation trips in the islands. These administrative positions and field teaching trips had helped me very much in serving the Cause. As a housewife, my wife had her own role to play, especially in providing warm hospitality to the visitors and friends of the Bahá’ís. She was my strength and shield. A word in conclusion. There had been a lot of achievements for the Cause in Andaman and Nicobar Islands. All I want to say in utter humility and with all sincerity that these achievements have nothing to do with me. They were victories of Bahá’u’lláh. I was only an instrument in the hands of Bahá’u’lláh. I shall ever be grateful to the Spiritual Assembly of the Bahá’ís the Andaman and Nicobar Islands, the entire Bahá’í Community of the Andaman and Nicobar Islands, Continental Counselors, National Spiritual Assembly of the Bahá’ís of India, and especially the Universal House of Justice for giving me the best opportunity to serve the Cause of Bahá’u’lláh in the Andaman and Nicobar Islands. May God bless all the senior officers in Andaman for giving assistance for the Faith. I am aware that most of them are promoted to very high posts at the time of writing this story. I had wanted to stay on in the Andaman and Nicobar Islands for a longer period, as the results were flowing in well. But as soon as news of my father-in-law’s demise reached us we had to leave for Mainland India. When we were in India a Tsunami hit the Andaman and Nicobar Islands on December 26, 2004. We lost all our household things, important documents such as Indian Passports, and our Educational Certificates. And owing to several other domestic situations, we could not return to Andaman and Nicobar. Our hearts are still there. Although I lost my documents, today I am working in a software company without evidence of my educational qualification- another living testimony of the infinite mercy of Bahá’u’lláh. 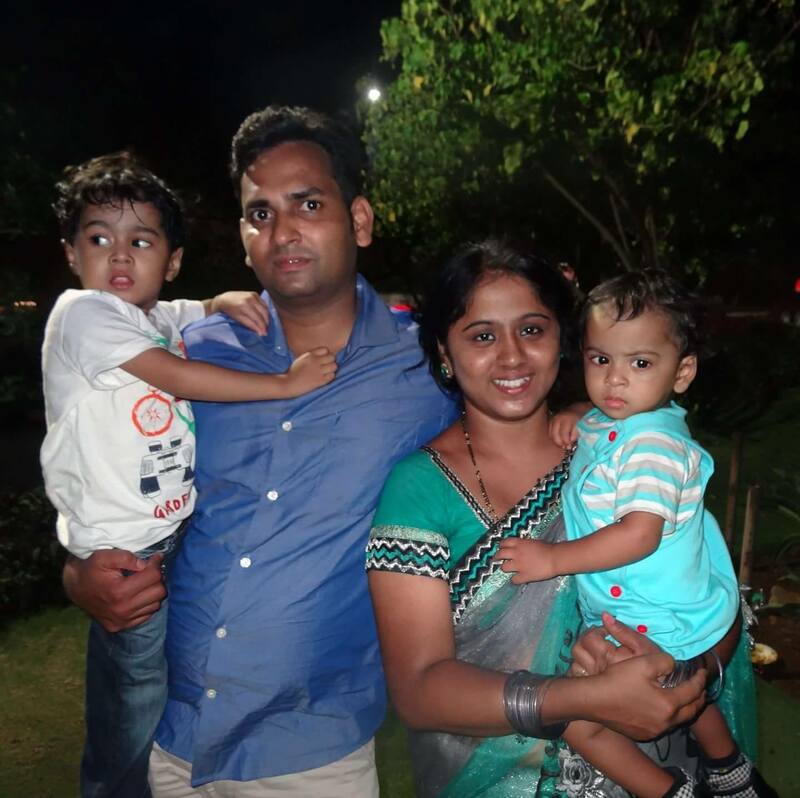 Our only daughter Kamala is married to M. Jagadish Kumar, and they are living a happy Bahá’í family life with two sons- James Vincent and Aaron Joel. 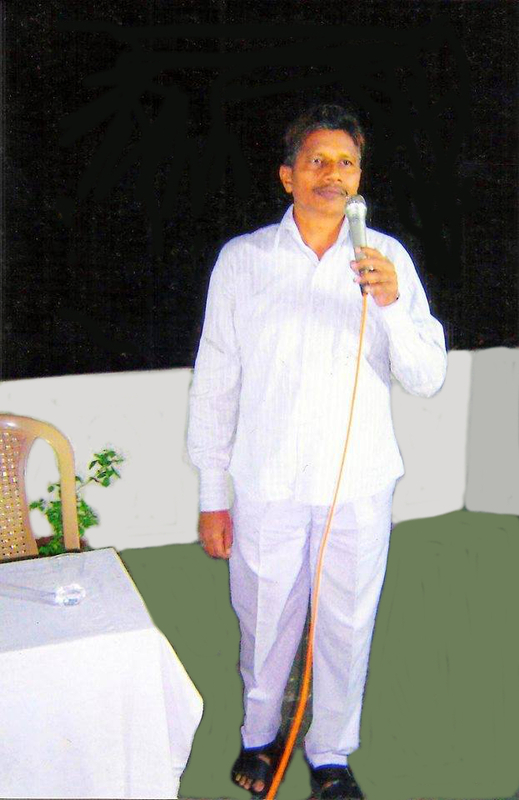 Jaya Raju Thota has been serving the Cause of Bahá’u’lláh from the age of 24 in various capacities, such as Assistant to the Auxiliary Board Member for Protection, State Bahá’í Council of Andhra Pradesh and its committees, State Bahá’í Publishing Committee, and the Local Spiritual Assembly of the Bahá’ís of Hyderabad & Secunderabad and its committees. He was also coordinator of both School Committees of West and East Andhra Pradesh, and a translator of several Bahá’í literature. He currently lives in Greater Visakhapatnam Smart City. His current occupation is Editor/Proof Reader of a US-based online Medical Transcriptions.